Former Paralympian Oscar Pistorius has filed papers to the Constitutional Court appealing his 13-year sentence for murder. 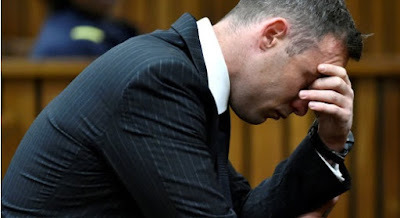 Last month the Supreme Court of Appeal (SCA) in Bloemfontein increased his sentence to 13 years and five months in prison for the 2013 murder of his girlfriend Reeva Steenkamp. The court said Pistorius should have been sentenced to 15 years, but the SCA took into account the time he had already served. The State had applied to have Pistorius's initial six-year prison sentence increased. The world-renowned athlete was arrested on Valentine's Day in 2013 – the day of the killing. He fired four shots through a bathroom door, claiming that he believed there was an intruder in the bathroom. The State petitioned the SCA directly, arguing that the six-year sentence was far too lenient. Now he is getting 13 years. Abeg,na who play that booking b Amen? ?.I won Kno if the game comes?? ?